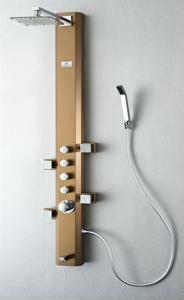 Bathroom Vanities and Accessories Design and Tips | DecorPlanet.com Blog: Should you splurge on a showerhead? Live Chat10 AM - 7 PM EST. Should you splurge on a showerhead? There are a lot of things that you can do to create a beautiful space in your bathroom. Depending on your budget, you can renovate your room and replace everything with brand new state-of-the-art equipment. However, if you can only afford so much, you have to be smart about which bathroom accessories or fixtures you are going to spend a pretty penny on. According to the Herald News, one item that you should at least splurge on is the showerhead. This is not only a necessity, but believe it or not, it's easy to find models as inexpensive as three dollars. Of course, why not spend a little bit more and turn your shower into a spa? If you were going to spend a couple hundred of bucks for a spa retreat, you might as well get a shower panel that will offer the same benefits - and you can at least use it over and over again. Look for a shower panel that also includes a handheld sprayer and multiple massage settings so that you and your family members can enjoy a relaxing time in the shower after a busy day at school or in the office. Is it time to replace your bathroom vanity? DecorPlanet.com specializes in selling luxurious home and bathroom products including bathroom vanities, bathroom faucets, bathroom cabinets & mirrors, bathroom shower panels, and a variety of other contemporary bathroom items online at discount prices. During our time in business, we have established favorable business relationships with many factories that meet the highest industry recognized standards at favorable and/or discounted prices. By continuously broadening the business scope and scale through rigorous efforts, we will continue to offer many more wholesale priced products, thus broadening the variety that a customer demands. © 2006-2014 DecorPlanet.com. All Rights Reserved.